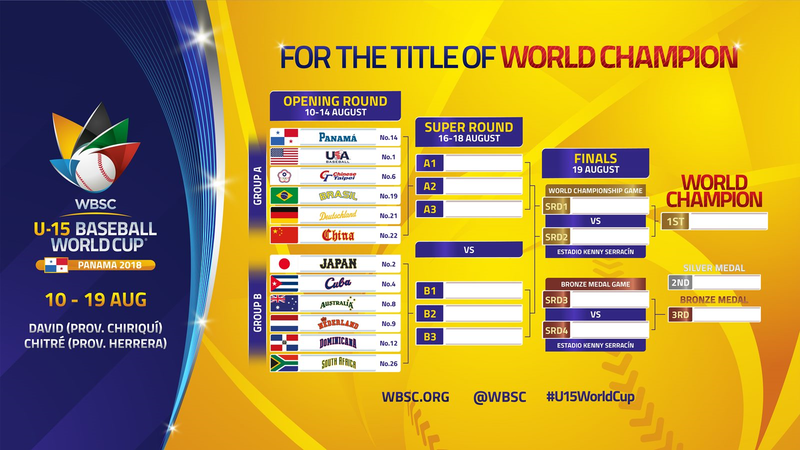 The World Baseball Softball Confederation today announced the groups, venues and tournament bracket for the WBSC U-15 Baseball World Cup® 2018, which will be staged from 10-19 August in the Central American country of Panama, where baseball is the national sport. The new US$ 16 million, 8,500-seat Estadio Kenny Serracín in David (Province of Chiriquí) -- now one of the top baseball facilities in Panama -- will serve as the flagship venue of the IV U-15 Baseball World Cup, hosting half of the Opening Round games, the complete Super Round and the Finals. The 3,000-seat Estadio Rico Cedeño in Chitré (Province of Herrera), which is the home of Panama Professional Baseball League (Liga Probeis) club Toros de Herrera, will host half of the Opening Round games and be the home of the 7th-12th place Consolation Round. The stadiums dedicated to the WBSC U-15 Baseball World Cup 2018 in August have been granted by the Panamanian Institute of Sports (Pandeportes), the Government of Panama, in collaboration with the organising committee, the Panama Baseball Federation (Fedebeis Panama). WBSC President Fraccari said: "An exciting stage is being set in Panama to welcome the world's best 13- to 15-year-old baseball players and future stars, who will be playing for their National Teams and competing in the highest-level tournament in their age group. The WBSC is proud to be the only international sports federation [IF] to stage World Cups from the U-12 to the professional level, giving our athletes and the countries they represent the opportunity to shine on the world stage and evolve the future of our sport." The 12 qualified nations have been drawn into two groups of six and will set out to compete For the Title of World Champion in the U-15 youth category with a round-robin. Group A features a global footprint that covers the Americas (North-, South- and Central America) Asia and Europe: Host/No. 14 Panama, 2015 U-15 Baseball World Cup bronze medal winner and current world No. 1 United States, No. 6 Chinese Taipei, No. 19 Brazil, No. 21 Germany and No. 22 China. Group B features an even bigger global collection with representatives from all five Olympic continents: Africa, the Americas (the Caribbean), Asia, Europe and Oceania. The group featuThe top three finishers from Groups A and B will advance and go head-to-head in the Super Round. The two U-15 National Teams with the best win-loss records following the Super Round will compete in the Final for the U-15 World Cup trophy at Estadio Kenny Serracín on Sunday, 19 August. The game schedule as well as broadcast and live-streaming details will be announced in future releases. res two-time (2014 and 2016) defending U-15 Baseball World Cup Champion Cuba, No. 2 Japan, No. 8 Australia, No. 9 Netherlands, first-timer/No. 12 Dominican Republic and No. 26 South Africa.